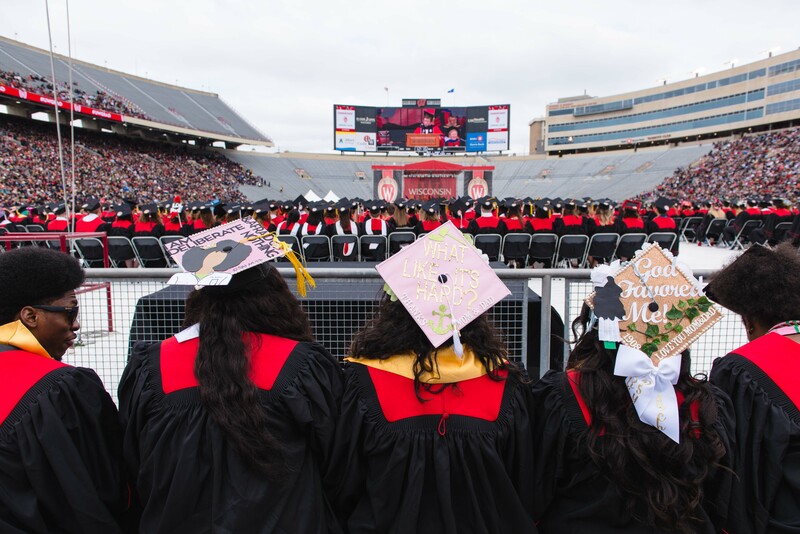 In a Saturday afternoon mercifully free from rain, 6,520 University of Wisconsin students graduated in a commencement ceremony held at Camp Randall Stadium. As keynote speaker, ABC broadcaster and Emmy award-winning journalist David Muir spoke of his experience in international reporting to a crowd of more than 40,000 people. “You will never forget what happened in the world while you were a student here, the election you witnessed. And one thing I’ve learned from the news these last couple of years is that when you get a chance to come to Wisconsin, you definitely come,” Muir joked, alluding to the notion that Hillary Clinton lost Wisconsin in the 2016 election in-part because she did not campaign here. Four years ago, when Muir was reporting from the Syrian border on child refugees, he witnessed children who, after working seven hours a day in the fields picking potatoes, would skip to their makeshift schools, smiling all the way. In referencing this incident, Muir said the desire to learn and the aspiration for a life full of opportunity is the same in America as it is in the far-flung parts of the world he has traveled to as a reporter. David Muir and Chancellor Rebecca Blank walk to give their commencement addresses. 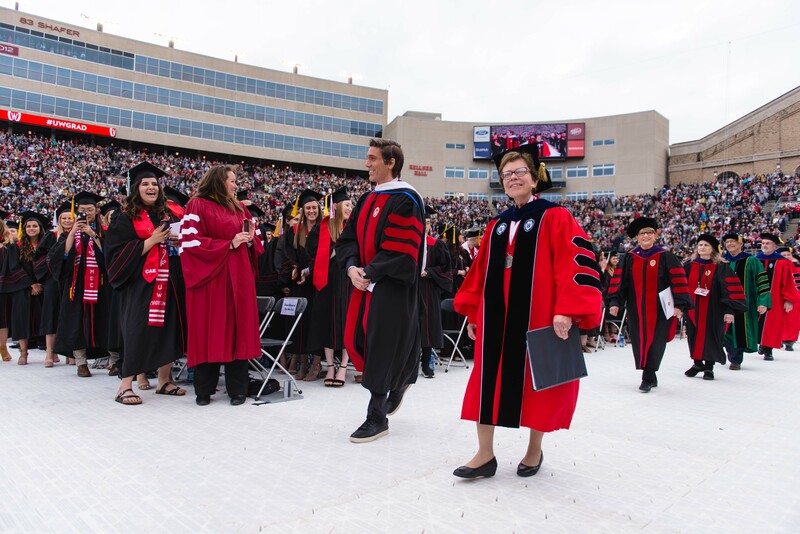 Chancellor Rebecca Blank commended the more than 7,000 students who received degrees from the university this spring — with specific shout-outs to a handful of graduates. Blank offered three pieces of advice to the graduating class: Think small, unplug from the internet occasionally and, whenever given the chance, help somebody else learn something new. “If you keep asking that question, you will keep finding ways to use your knowledge and skills to make the real world a little better,” Blank said. 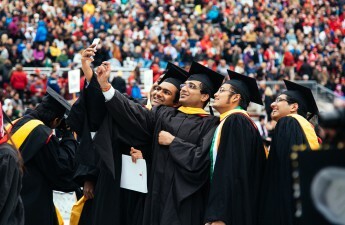 Before the graduates made their matriculation official by flipping their tassels, several other students and faculty gave speeches highlighting the class’ accomplishments. Senior class president Ariela Rivkin told stories of her challenging but fulfilling experience as a Jewish person on campus, while UW Regent Regina Millner honored Sam Carlson — a former member of the Air Force and social worker in Kenya who graduated with a nursing degree. And in her final ceremony as Dean of Students, Lori Berquam, acting as Master of Ceremony, awarded honorary degrees to diplomat Linda Thomas-Greenfield, atmospheric scientist David Fahey and philanthropist Jerome Chazen. 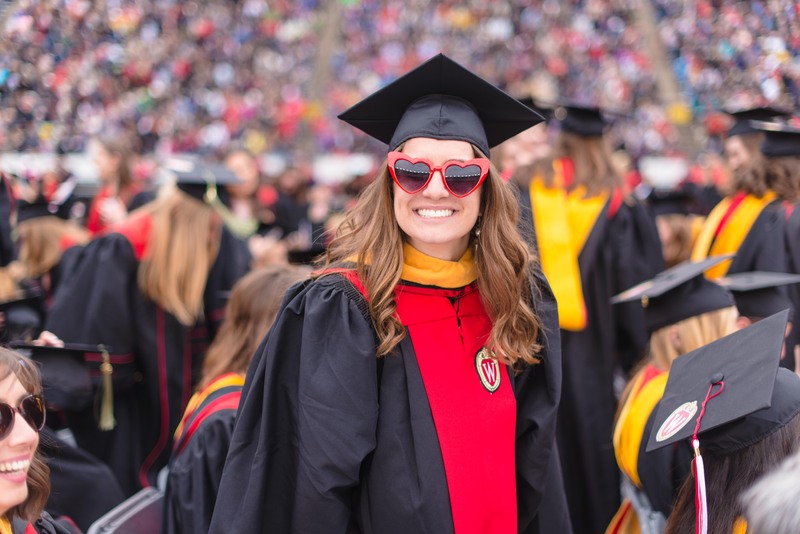 A graduating student smiles before commencement. Muir said the principles of a good journalist — like seeking truth and asking tough questions — applies to many disciplines, and stressed the fear that will come with new experiences and opportunities should be embraced. Muir relayed a story from when he was four years old and afraid on his first day of kindergarten. The bus-driver, noticing Muir remained on the bus after all the other students had filed off, made a deal with him: She would walk him to class, and if he decided he didn’t like it, she would take him back home. After walking into class and immediately deciding school was “not for him,” Muir turned around to see his bus-driver exiting the building. 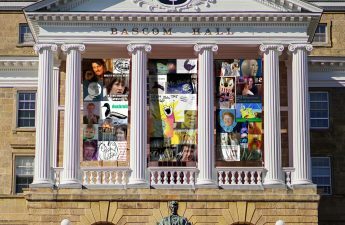 The thousands of students sitting on the turf of Camp Randall are at a similar crossroads in their lives, he said.